Process flour, Du Chocolat, Natvia and salt in a food processor until combined. Add butter and pulse until the mixture resembles breadcrumbs. Add egg and vanilla and process until just combined. Turn out onto a floured surface and bring together with your hands into a ball. Flatten slightly, wrap in plastic wrap and refrigerate for at least an hour. Preheat the oven to 190C. Grease a loose-based tart pan. Roll the dough out until it’s large enough to cover the base and sides of the pan and gently press down. Prick with a fork, then line with baking paper and fill with baking beads or rice. Bake the tart shell for 20 minutes, then remove the baking paper and bake for another 5 minutes. For the filling, combine the cream and Natvia in a saucepan and bring to the boil. Add the chocolate pieces and stir until they melt. Beat the eggs, then add them into the mixture. 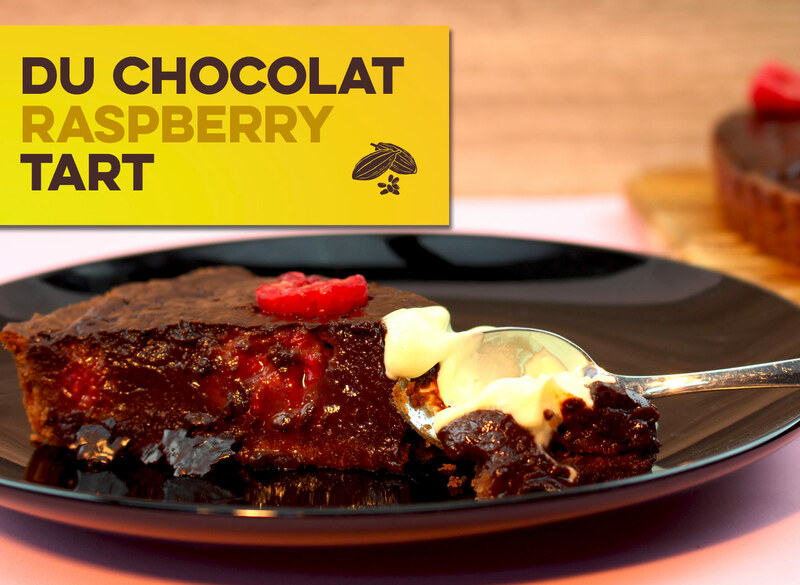 Scatter the raspberries over the cooled tart case, then pour over the filling. Return to the oven and bake for 20 minutes, or until the filling is almost set.